The people of Great Britain have endured a lot of hardships over the centuries. Invasions by the Romans and the Vikings. The German bombings in World War II. The political and religious strife in Ireland. The death of Benny Hill. So many tragedies. And yet, there's no doubt that the people of the British isles have a great amount of spirit and always bounce back from heartbreak. In the films of Irish director David Keating, the people not only bounce back, but they come back from the dead. It seems that the never say die attitude of the Brits is taken quite literally in his films and the supernatural is always at work. This is on display in his sophomore feature Cherry Tree. Cherry Tree introduces us to Faith (Naomi Battrick), who lives in a small town in Ireland. Things are not going very well for Faith. She's bullied by the mean girls on her field hockey team and she's just learned that her father's (Sam Hazeldine) cancer has advanced and that he doesn't have long to live. The mysterious new field hockey coach, Sissy (Anna Walton) approaches Faith with a proposition. Sissy is part of a cult which derives their power from an ancient cherry tree. If Faith will help the cult, Sissy will cure her father. Faith is skeptical, even after a demonstration of Sissy's power. However, she truly loves her father and is willing to travel to the dark side in order to save him. Are you afraid of centipedes? Does the mere thought of seeing one crawling on the wall, or even worse, a person, make your skin crawl? Well then, you need to stay very far away from Cherry Tree. Instead of black cats, the witches (I guess they were witches. Witches were mentioned.) in this film have centipedes as familiars...and they are everywhere. I don't know who represents these centipedes, but they deserve a raise, as the centipedes got more close-ups than most of the actors. Everyone else should avoid Cherry Tree because it's not a very good movie. Director David Keating and Writer Brendan McCarthy first teamed-up on the disappointing, but similarly themed, Wake Wood and they've seriously hit the sophomore slump, as they've somehow managed to make an even worse film this time around. As we aren't privy to all of the ins and outs concerning how a movie is made, I'm not sure who to blame for this one, but I'm leaning towards Keating. McCarthy has taken a very old and tired concept -- selling your soul to help a loved one -- and attempted to place a new spin on it. Here, we have a teenaged girl shouldering the burden of placing her life in danger to save that of her father. All the while dealing with the usual pressures which accompany adolescence. Faith wasn't the most fully-formed character, but I did like the fact that she was smart enough to not completely trust a witch. Well, that's the first half of the film at least. Things really fall apart on all counts in the second half. Faith begins to make some questionable decisions and the nothing which Sissy does in the finale makes any sense. The story attempts to shock us by going dark, but it feels very hollow. This has to do with the fact that the editing get weird in the third act. We get some repeated scenes, which feel like padding, and some seemingly important events are only half-glimpsed. A chase, if you want to call it that, feels as if it's taking place in several different movies. Cherry Tree honestly gives the impression that a completely different crew came in to shoot the last twenty minutes or so. Oh, and did I mention that the history of the supernatural dealings in the town which is offered in the first act apparently only applies as a blueprint for the movie, as the specifics are never brought up again? 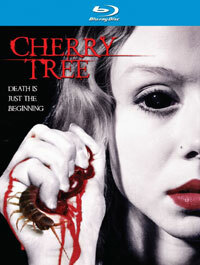 Any disappointing movie is...well...disappointing, but I really wanted to like Cherry Tree. A foreign film which deals with local supernatural superstitions always offers a lot of promise, but this one fails on every account. I can only guess that someone's cousin is a centipede wrangler, as we get a wealth of centipedes and then many scenes which don't really gel. Much like the titular tree itself, this movie has many branches and they are all going off in their own directions. Cherry Tree looked like an arcade from 1980 on Blu-ray Disc courtesy of Dark Sky Films. The film has been letterboxed at 1.78:1 and the Disc contains an AVC 1080p HD transfer which runs at an average of 32 Mbps. The image is sharp and clear, showing no distracting grain and no defects from the source materials. The film has a decidedly dark look in the nighttime scenes, but the reds always jump out in the color palette. The level of detail is good, as the image is never soft, and the depth is what one would expect from a modern film. The Disc carries a DTS-HD 5.1 Master Audio track which runs at 48 kHz and an average of 2.0 Mbps. The track provides clear dialogue and sound effects. The scenes in the bar and the field hockey game provide some noticeable surround and stereo effects, as does the finale. Although, I can say that the effects were impressively detailed. These same scenes deliver modest, yet evident subwoofer effects as well. The Cherry Tree Blu-ray Disc contains only two extra features, one of which is a TRAILER. The other is a "Making Of" (12 minutes) which offers comments from Director David Keating, who describes the film as "creepy and disturbing" and "deeply unsettling". I wish that I'd seen that movie. We also hear from some of other members of the creative team, as well as the cast. The most interesting piece here is the look at the location shooting in Cork.